Q. Where do Rubber Chickens come from? A. 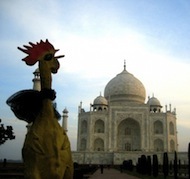 The origin of the rubber chicken is shrouded in mystery. Elderly comedians often credit the legendary British Clown Joseph Grimaldi, inventor of the art of prop humor in the 1800’s. HOWEVER, since the latex injection technology, so necessary to the birth process of a rubber chicken was not invented until after WWII, it’s probably safe to write off the speculations about Grimaldi, as well as the other theory that rubber chickens were tied to muskets in the French Revolution . . . Probably the closest to the truth is to credit the birth of this remarkable fowl to the Loftus Novelty company which, in 1939, produced a rubber chicken most looking like those we see today. 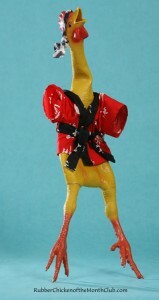 NOTE: Under the more sophisticated name, Loftus International, the company still produces rubber chickens. Q. 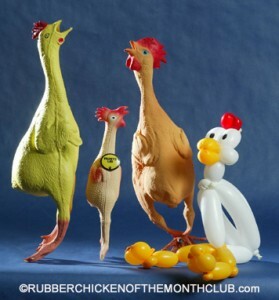 Are all Rubber Chickens alike? Q. What do Rubber Chickens have in common? Q. Do Rubber Chickens die? 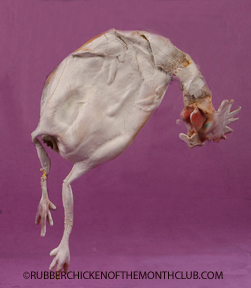 When exposed to the toxic environment found in some offices, the more sensitive chickens, such as the one below, can actually disintegrate. 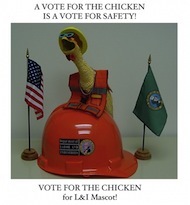 A good rubber chicken can last for years, especially if it is well cared for and frequently cooped up (for the most part chickens enjoy being cooped up) in a box or file cabinet. Leave them out only in upbeat, positive settings where their natural inclination to bring laughter while reducing stress can be most appreciated.